It finally dawned on me (pun intended) that I had been limiting myself by taking pictures that look similar to iris vendor catalog shots. The pictures in vendor catalogs generally show you a close-up looking at the middle of a fall or looking between two falls. This is a good way to show us the primary characteristics and coloring of the iris so that we know what we are buying. But why continue to take pictures as if I am a vendor when I am not? I am not going to publish a catalog or send out a brochure. I can have more freedom, options and artistic ability if I take a variety of different poses from different distances. This photograph has four open blooms, a different perspective, and several buds as well as several blurred clumps in the background making for an interesting color combination and artistic composition. 'Elizabethan Age' is so stately and loves to bloom with its identical quadruplets. In contrast, I took these pictures in the traditional "catalog pose". I love them both and think it's a great way to photograph each bloom, but the purpose of this article is to explore other perspectives as you will see below. Notice in this photograph I am capturing two blooms at once as well as two flanking buds. This was 'Prague's' second year blooming in our garden and I especially enjoyed peeking at the underlining of the falls. 'Victoria Falls' makes a wonderful splash of blue when photographed from eight feet away. As long as you have no heavy winds, you will love this flower. Foreground has 'Mink Pink' by Brad Kasperek and in the distance 'Winning Hand'. I believe this picture is more enjoyable because of the combination of flowers. I was pleasantly surprised by the blend of colors from our maiden bloom of this flower. 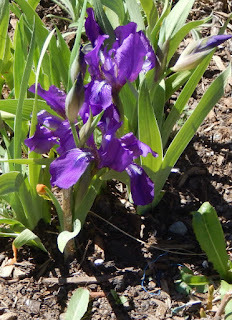 This iris has flowers tipped every which way but they are "charming". 'Drama Queen' never takes a bad photograph. I deliberately sharpened the focus on the front flower and blurred the one behind. To me, this makes the picture more artistically pleasing. 'Romantic Gentleman' was also a maiden bloom this year. 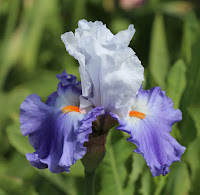 I would have taken more pictures of this iris with it's lovely color and branching, however, this bloom is particularly susceptible to white spots from rain and we had a lot of rain during its bloom period. Don't forget to take some far away shots and even some panoramic ones. I can't think of a better way of showing the garden setting. Another advantage is the weeds don't show as much. 'St. Louis Blues' is fairly old but look at the contrasting beards, the branching. and the rich blue color. This image has one image superimposed on top of the other. I think it adds novelty. This was a maiden boom and I appreciate one in front of the other. This pretty bloom branches itself beautifully as if competing for attention. Do you find yourself producing photos that conform to the conventions of the iris catalogs? Try some different angles and see how you like the results. Let me know your results or better yet publish them or send me a copy. Have fun and experiment a little with some new perspectives. Honey, I Shrunk the Irises! An oxymoron is a phrase whose parts seem to contradict each other, like jumbo shrimp. 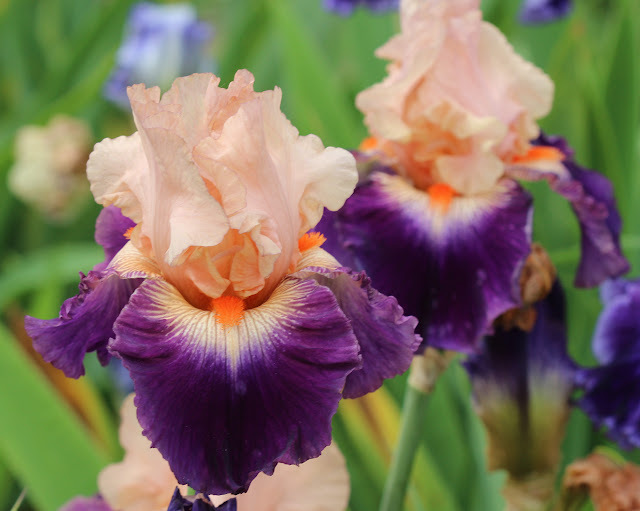 In the iris world, we have the rather perplexing term miniature tall bearded. 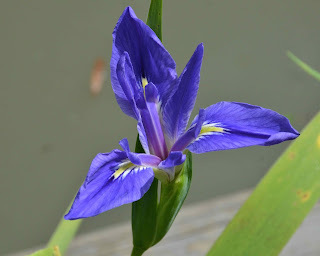 How can an iris be both tall and miniature? Of course the word "miniature" here must be taken in a relative sense: these are irises much smaller than the standard tall bearded irises which they otherwise resemble. Bearded irises are categorized into six classes, based mostly on height. Strangely, however, there are three classes that all occupy the height range between standard dwarfs and tall beardeds: intermediate bearded (IB), border bearded (BB) and miniature tall bearded (MTB). 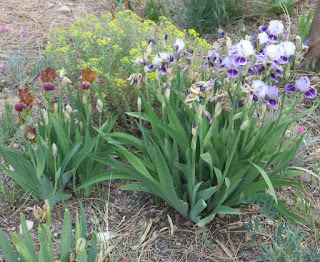 When I first became interested in irises in southern New Mexico in the 1970s, I found this rather confusing, moreso because at the time I had not grown any of these various types of medians. I asked a local club member about MTBs, and she said "I don't think anyone here grows those." 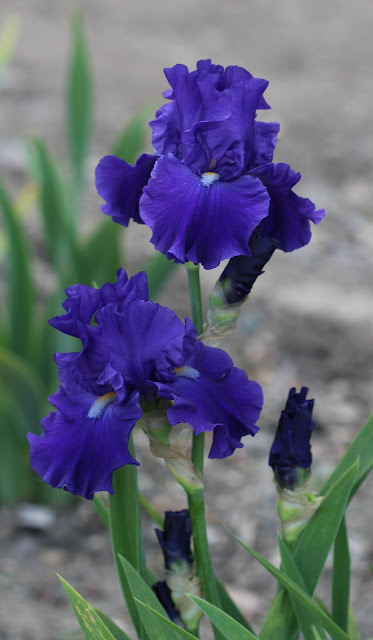 Happily, this group of irises has grown steadily in popularity since then. They are now widely grown, and one 'Dividing Line' (Bunnell, 2005), has even won the Dykes Medal. But what are they exactly? 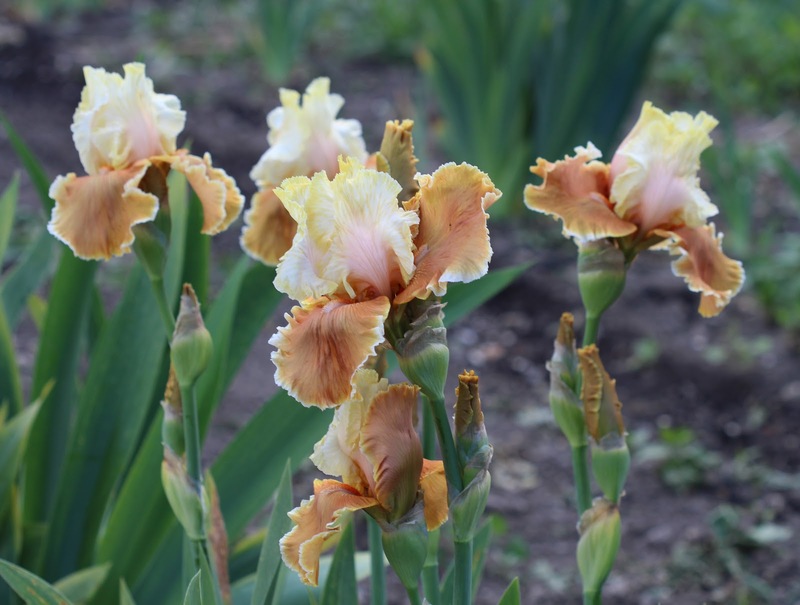 The answer takes us back to the 1920s and 1930s, when the popular tall bearded irises were changing rapidly through the work of the hybridizers of the day. 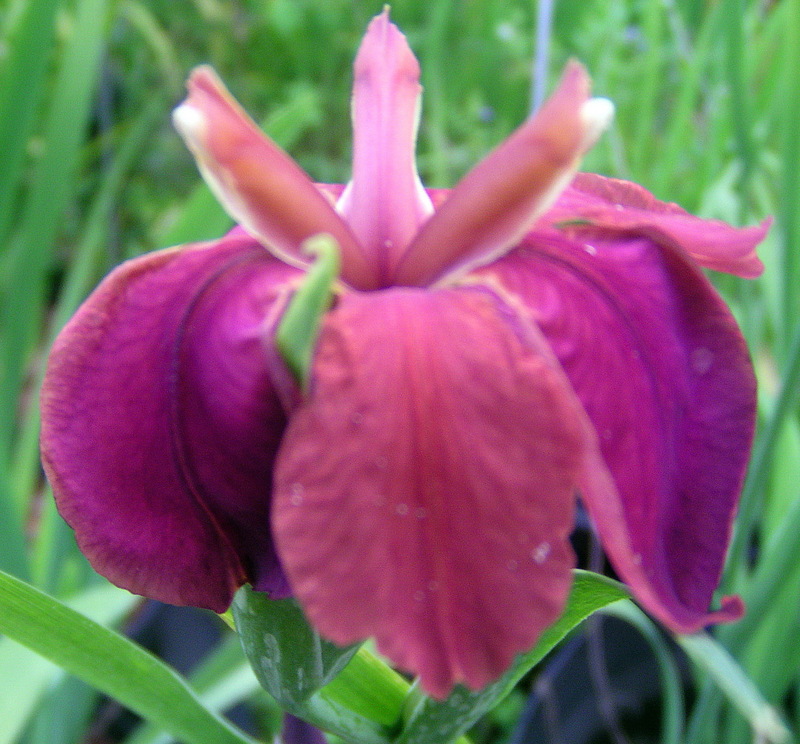 In particular, more and more tetraploids were being introduced and supplanting the older diploids in popularity. A tetraploid is a plant with four sets of chromosomes, whereas diploids have only two. Tetraploids are often larger and huskier than their diploid counterparts. 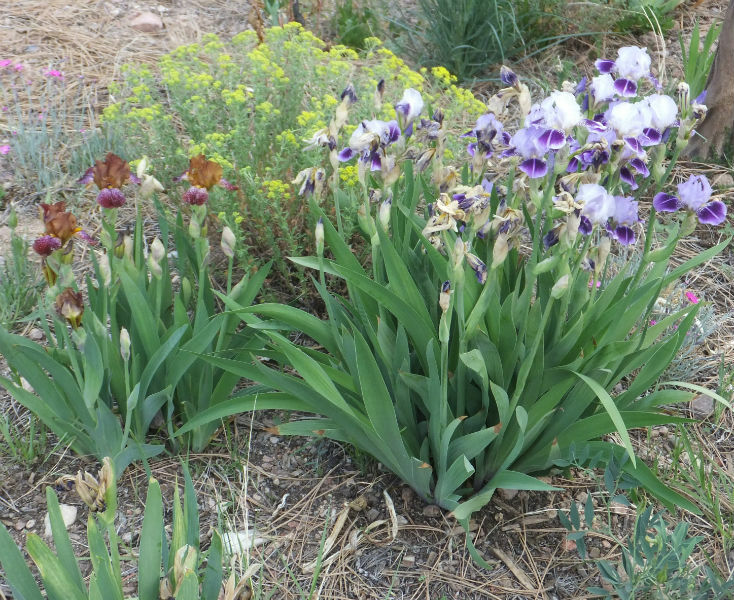 This was certainly the case with the TB irises, and the iris world was all enthused over the new large blooms and tall stalks. But there were a few people here and there who were less enthusiastic about the new "bigger is better" trend. Ethel Peckham, Thura Hires, and Mary Williamson were amongst the first to go against the trend and seek out the smallest TBs, rather than the largest. 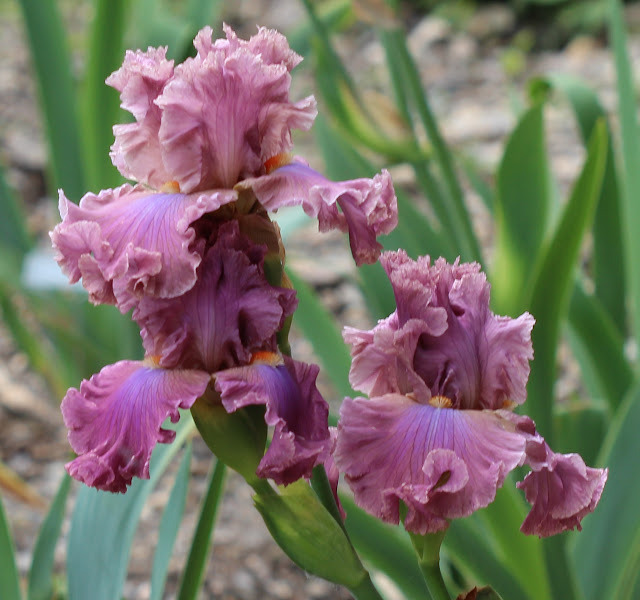 Mary Williamson's father, E. B. Williamson, was a noted iris breeder at the time, and the three ladies kept a close eye on his seedling beds looking for the daintiest, tiniest irises, which the hybridizer himself referred to as "runts". 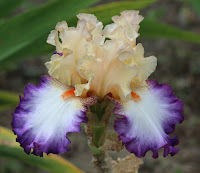 Pekham dubbed them "table irises" to call attention to their suitability for flower arrangements. These original selections were all diploids. Interest in the table irises declined as time passed, however, probably because they were not recognized as an official category, so had no awards or other encouragement. They might have been altogether forgotten were it not for the work of Alice White in the 1950s, who tirelessly promoted the table irises. The timing was right, as this was an era when there was a surge of interest in dwarf and median irises. 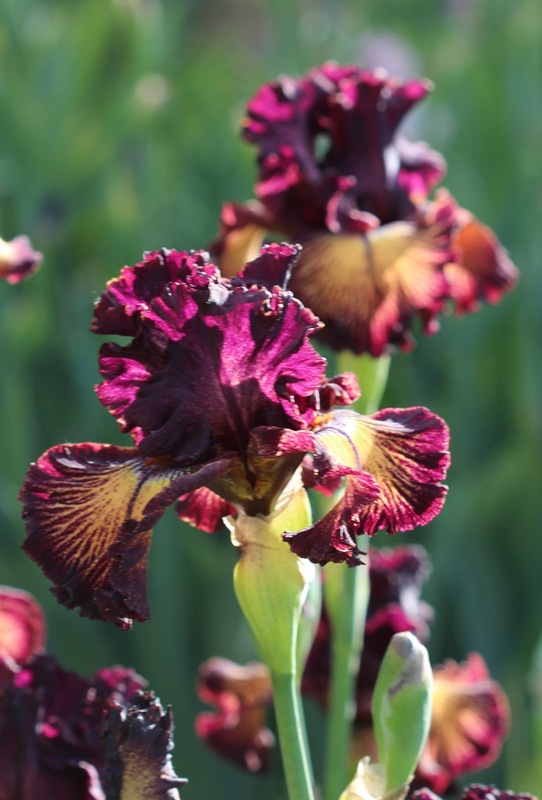 New types were being developed, and it became apparent that a new system of categories was needed to accommodate the many different sorts of irises smaller than the TBs. So in 1957, the miniature tall bearded class was created. 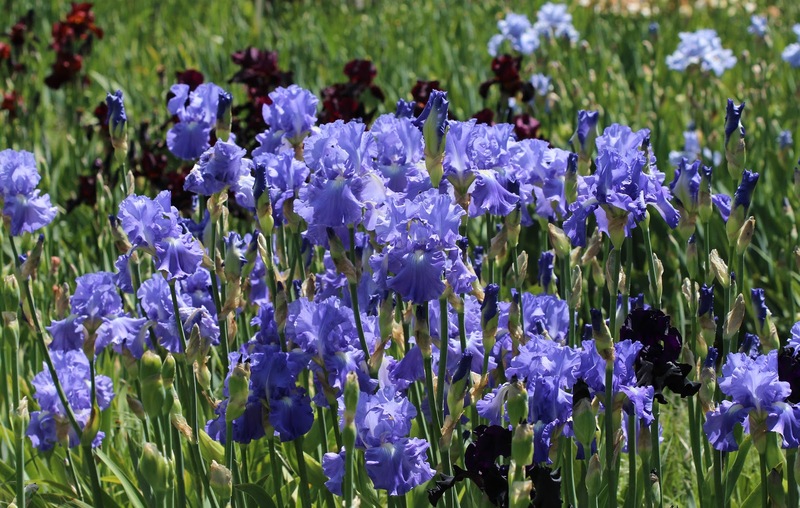 This name was chosen over "table irises" to emphasize that they can be appreciated as garden plants in their own right, not just for flower arrangements. The requirements of the MTB class are stricter and more exacting than any other. Not only must they fall in the proper height range (41 to 70 cm, although the center portion of that range is preferred), but they must also meet limits for flower size and even stem diameter. In many ways, the standards of the class are a reaction against the prevailing trends in TB breeding. Instead of taller and taller stalks with larger and larger blooms, MTBs must be truly miniature and dainty in all respects. As noted above, the original MTBs were all diploids. That is no longer the case, but diploids remain the most prominent type. 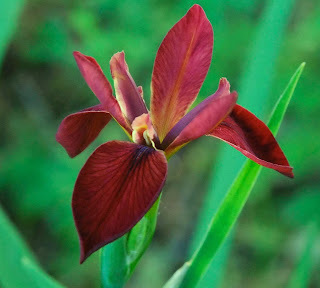 Although a variety of different bearded species are in the background of the diploid MTBs, the dominant influence is from Iris variegata, a dainty median-sized species from eastern Europe, usually yellow with red or brown veins covering the falls. Its wiry stems curve gracefully, resulting in a slightly zig-zag branching pattern. The blooms have a nice flaring form. There are many modern diploid MTBs in which the variegata coloring and form are much in evidence, but the range of color and pattern goes beyond that into white, blue, violet, plicata, orchid, and blends. Some recent favorites of mine include 'Redrock Princess' (Witt, 2006), 'Peebee and Jay' (Schmieder, 2006), and 'Hot News' (S. Markham, 2009). Although the tetraploid TBs are larger than the diploid TBs, there are tetraploid bearded species in all different sizes. 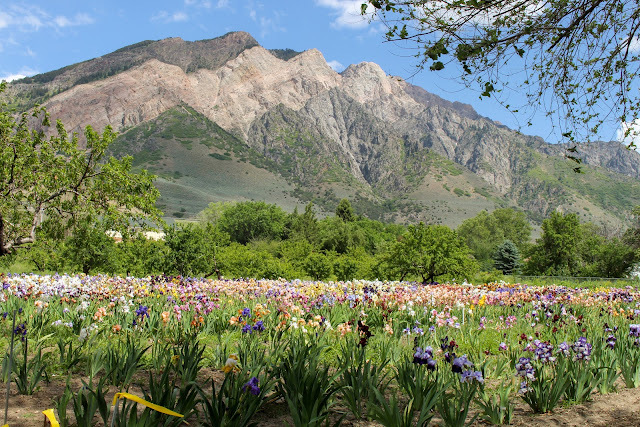 Early on, some creative hybridizers such as Ben Hager realized that it might be possible to breed tetraploids that would meet the strict size requirements of the MTB class. 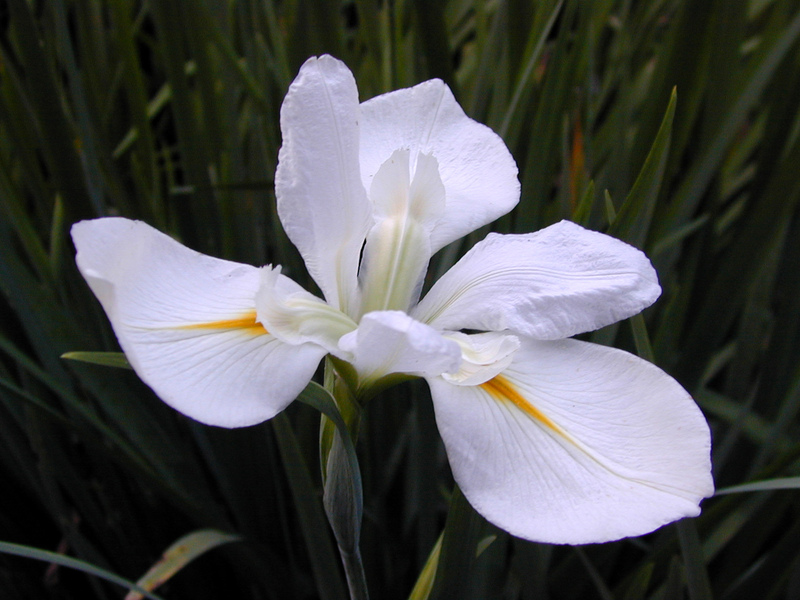 Hager used Iris aphylla, a copiously branched small bearded species to create tetraploid MTBs, introducing many in the 1970s and later. Why undertake such a project? 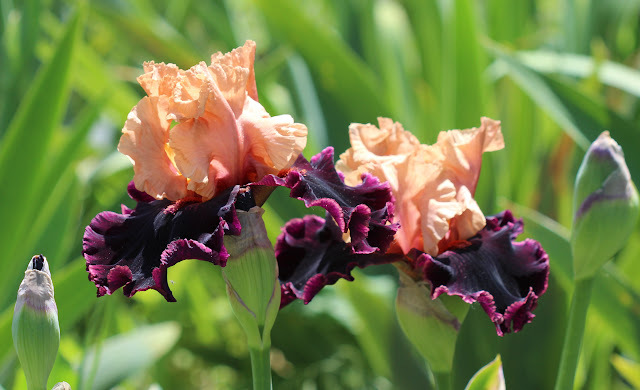 One reason is that there are colors and patterns in the tetraploid bearded irises that simply do not exist in the diploids. Tangerine pink is the best-known example. If you want a true pink (or orange, or red-bearded white) MTB, it will have to be tetraploid. to be stiff, with branches from the base of the stalk that stay parallel to the main stem. 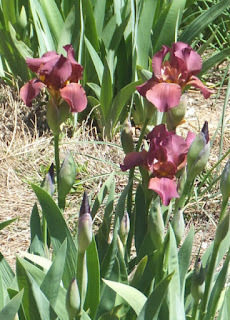 This can lead to a crowded, coarse appearance far from the MTB ideal of grace typified by diploids from Iris variegata. Still, with diligence and patience, the difficulties were gradually overcome, and today we have quite dainty and graceful tetraploid MTBs to complement their diploid counterparts. 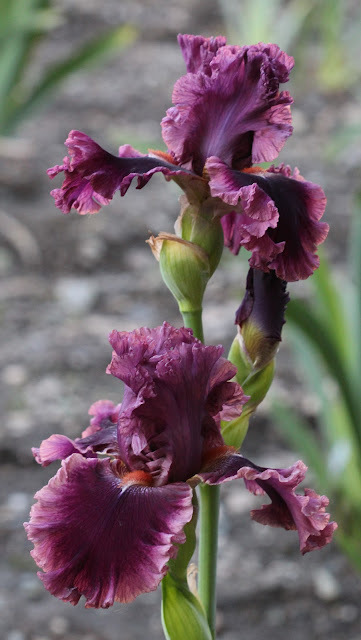 Some favorites of mine include 'Say Red' (Craig, 2008), which has three buds in each of its many sockets, and seems to just keep on blooming forever, 'Tic Tac Toe' (Johnson, 2010), a lovely pink and pastel violet bicolor, and my new favorite 'Silver Ice' (Black, 2013) an almost-white plicata with beautifully formed ruffled blooms. 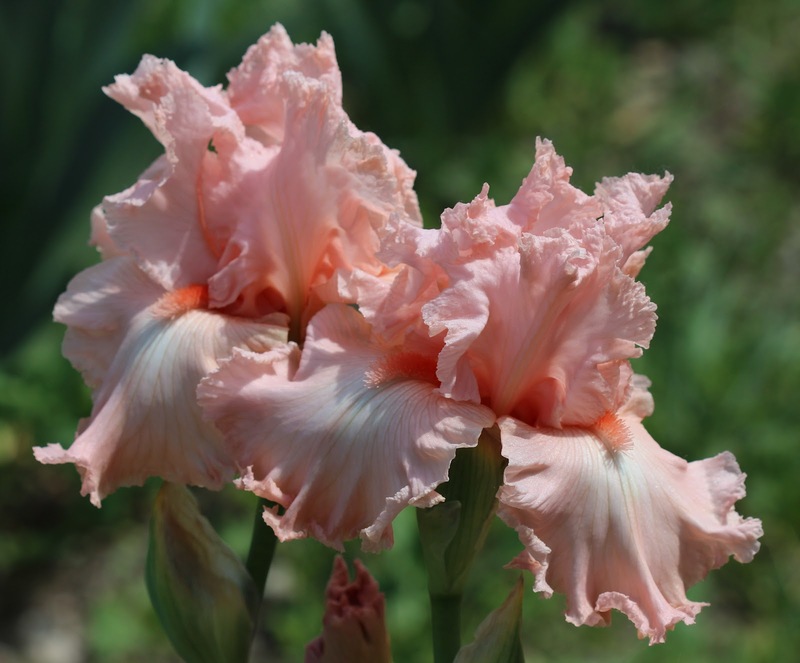 Although some were initially skeptical regarding tetraploid MTBs, there is no doubt now that they are here to stay, giving us even more choices and possibilities within this class of delicacy, daintiness, and refinement. Have you tried MTBs in your own garden? Do you prefer diploids or tetraploids, or do you enjoy some of each? 'SISTERHOOD' (Van Liere '11) This bed always does well. Pictured here are just a few of my season favorites. Some are relatively newer cultivars, while others are older classics that have performed well over the years. 'GLAMAZON' Blyth '07 Beautiful in every way! 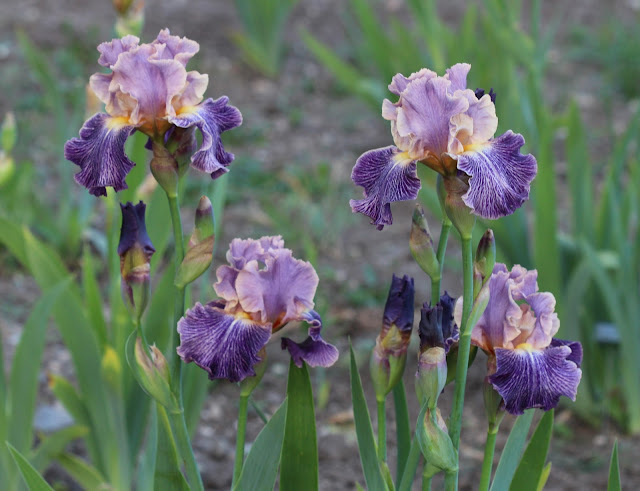 July and August are busy months in Zone 6 in the iris beds: dividing existing clumps, planting new rhizomes, relocating others and revamping beds with companion plants. I always take time to evaluate the successes or failures of the previous bloom season, and try to improve the beds. There have been several times I was ready to call it quits with an iris, thinking, despite my best efforts, it just wouldn't grow in my zone. But after transplanting it to another area in the garden, it wound up thriving. Although this isn't the case every time, more often than not, it is. 'GLAMAZON' (Blyth '07) is one example--it is now thriving after moving it. In its second year, several stems with huge blooms rewarded my patience--I'm so glad I didn't give up on it. Another example is 'EDITH WOLFORD' (Hager '86). It has been reliable and prolific for several years now after having marginal success with it in a prior bed. It never disappoints, blooming consecutively now for over 10 years. My advice to the beginning iris gardener is to always try another location before removing it for good. 'ENGAGEMENT RING' (Ghio '11) Every bloom is perfect! Another season favorite was 'ENGAGEMENT RING' (Ghio '11). This exciting bi-tone has excellent form, with clear, soft yellow standards and pure white falls rimmed in fuschia-orchid. The bushy bright gold beards against the stark white falls make it a stand out in the garden. It was not only a personal favorite, but visitors to the gardens voted it their favorite. 'DARKSIDE' (Schreiner '85) Outstanding black! An older black, but one that performs well consistently is 'DARKSIDE' (Schreiner '85). Although I have several other blacks, this is still one of my favorites in this color class. It's hardiness and reliability, even in an off year where other irises struggle because of weather-related problems make it a must-have in my garden. 'EYE FOR STYLE' (Blythe '06) Magnificent! 'ABOUT TOWN' (Blyth '97) A clump of this iris is glorious! 'KATHY CHILTON' (Kerr '06) Dramatic! 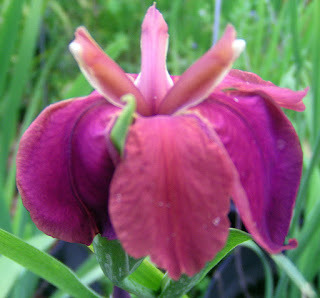 'ROMANTIC GENTLEMAN' (Blyth '02) Stunning! 'QUANTUM LEAP' (Sutton '05) I was very pleased with this first year bloom. 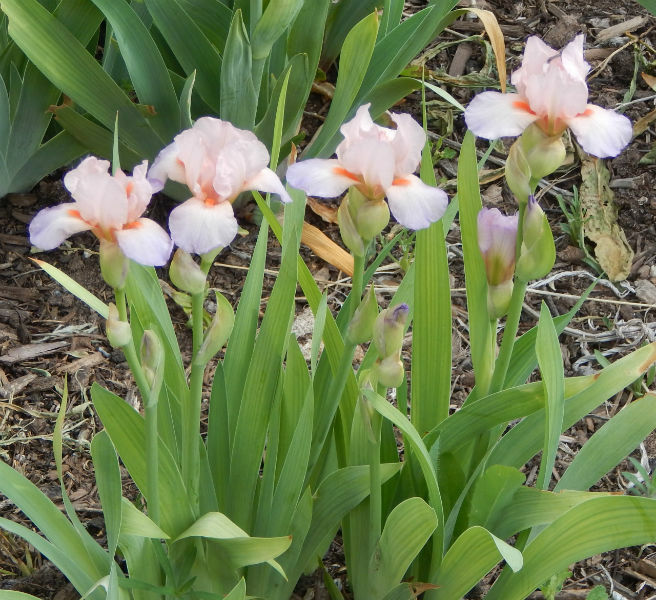 It was a gift from an iris friend--Thanks, Lori L.
'TENNESSEE GENTLEMAN' (Innerst '91) First-year bloom - a pleasant surprise! I could post several more season favorites, but time and space won't allow. I hope some of these favorites inspire you to add to your iris gardens, or have brightened your day a little. If you had a favorite in your garden this year, I'd love to hear from you. What makes it a favorite? In 2015, the Society for Louisiana Irises adopted a proposal by Charles Perilloux of Baton Rouge to create a “Louisiana Iris Species Preservation Project.” At the 2016 SLI convention, procedures and plans for the project were approved, and work has begun. The problem that has precipitated the need for the project is the disappearance from the wild of many of the forms of the five generally recognized Louisiana iris species which comprise the Series Hexagonae: I. hexagona, I. brevicaulis, I. fulva, I. giganticaerulea, and I. nelsonii. When the modern “discovery” and introduction to these plants to horticulture occurred in the 1920s and 1930s, they were already recognized as endangered. 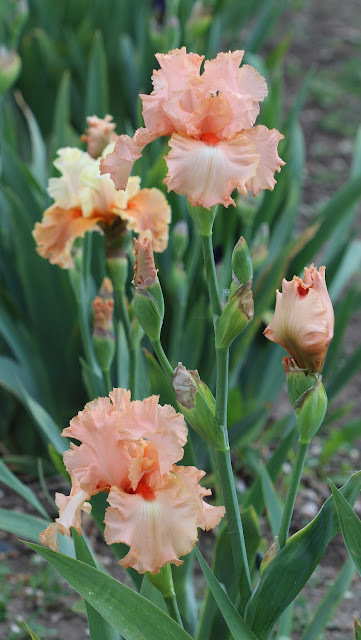 Dr. John K. Small first encountered these irises in Louisiana in 1925, and his subsequent publications in the Addisonia: Journal of the New York Botanical Garden were entitled “Vanishing Iris” and “Salvaging the Native American Irises” (both 1931). In Louisiana the irises are not currently threatened everywhere. 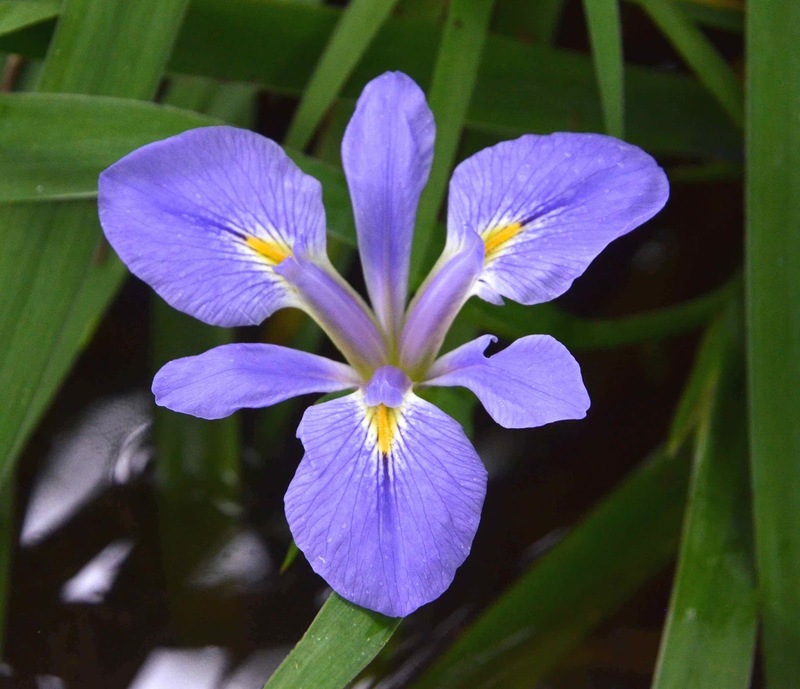 One can still see large stands of native irises in freshwater swamps and low wild areas. But the extent of these natural spaces has diminished markedly over the years. The current city limits of New Orleans, for example, once contained massive fields of irises, but development has destroyed them all. Louisianas are often seen in roadside ditches, but one pass of a road grader or a crew spraying herbicide wipes them out. I. hexagona, the first to be given species designation based on specimens from South Carolina, apparently is entirely gone from its state of origin. It is not just numbers of plants that are threatened. When a population is destroyed, any unique forms that may have developed in the area are also eliminated. 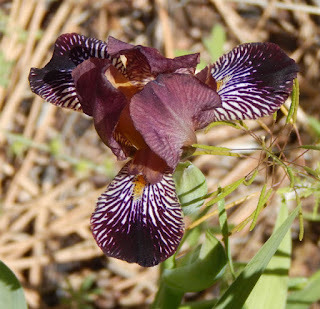 The Louisiana Iris Species Preservation Project is focused precisely on the need to preserve the range of colors and forms found among the native Louisiana irises. And the variety is remarkable. The species fulva and brevicaulis probably are more varied than the others, no doubt due to a much wider geographic range. Both extend well into the North, whereas hexagona and giganticaerulea are limited to the Southeast and Gulf Coast states. I. nelsonii is restricted to a few square miles in South Louisiana near the town of Abbeville. Interestingly, the BONAP site recognizes a sixth Louisiana iris species: I. savannarum. Savannarum was one of the species names applied by Dr. Small, but most authorities have abandoned it, lumping these irises, found mainly in Florida, with I. hexagona. BONAP, by contrast, shows hexagona as having a more restricted range from North Florida and up the coast to South Carolina. I. savannarum, following Small, is an iris that extends from North Florida down to nearly the Everglades. Saving the variety of species forms for posterity requires a long term and systematic effort. It will have to be implemented in phases and will take several years to achieve the full scope envisioned. In years past, many specimens have been “rescued” by those attracted to their unique beauty, but “saved” plants sometimes are forgotten and effectively lost as people pass from the scene or interests change. 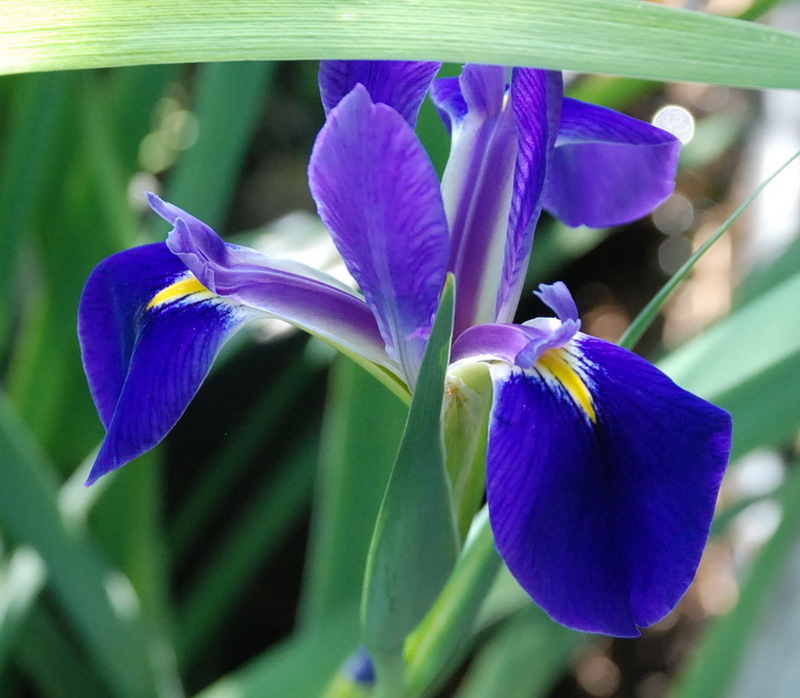 Without intervention, much of the genetic diversity of Louisiana irises will be lost to future generations. The approach of the Louisiana Iris Species Preservation Project is to create permanent collections of representative examples of the colors and forms of each species from throughout its geographic range. Once established and thriving in the collections, plants would be made available to individuals and organizations consistent with guidelines adopted for the project. A beginning has been made. Charles Perilloux chairs the SLI committee overseeing the project. 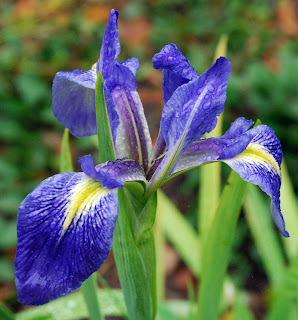 A list of over 50 specimens, often named irises, has been compiled, and many have been assembled in a planting in New Orleans. The Greater New Orleans Iris Society is taking a lead role in maintaining an initial core collection using space made available by City Park in New Orleans. “Stewards” have been identified who eventually will maintain duplicate plantings of some or all the irises on the Preservation List. The Project is in need of Stewards outside Louisiana. It is important to identify and maintain forms from the full range of the Series Hexagonae. At present, some species forms from around the country have been obtained, but all the Stewards reside in Louisiana. Some of the species, such as some hexagonas (or savannarums) do not thrive in Louisiana growing conditions, and a special effort is needed to create plantings in other states and regions. The Greater New Orleans Iris Society website has a page on the Species Preservation Project that outlines the organization and procedures of the effort. http://www.louisianairisgnois.com/SpeciesPreservation/ An upcoming article in the SLI publication Fleur de Lis addresses this also. The GNOIS website also displays in one place pictures of many of the irises currently included on the Project’s Preservation List. One often hears about the progress made over the years in hybridizing Louisiana irises and about the color breaks that have been achieved. A glance at the assembled pictures of the many species forms is an eye opener. Many of the color breaks we have welcomed were initially supplied by Mother Nature. As wildflowers, the Louisiana irises were already a remarkably varied group of plants, and the native forms need to be preserved.